The winner of last year’s Papatango New Writing Competition, Dawn King’s ‘Foxfinder’, conjured a haunting vision of a world built on the cultivation of fear. This year’s offering from Louise Monaghan explores fears and prejudices that lie much closer to home, bravely grappling with the thorny racial tensions that persist in modern Britain. 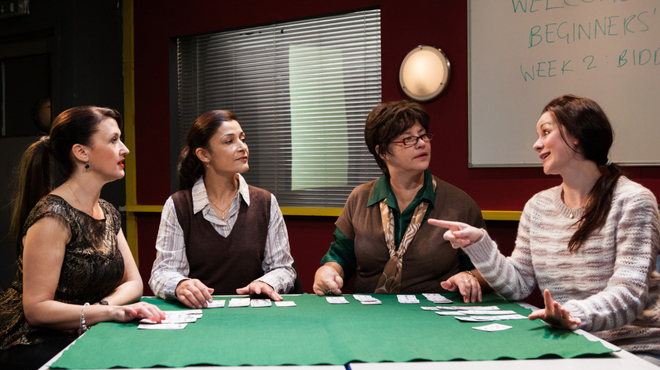 Monaghan’s quartet of female protagonists gather each week to master the rules of bridge, while beyond the walls of the community centre they are locked in a game in which the cards always seem to be dealt against them. Widow Deb struggles to raise her wayward teenage son, while her lifelong friend Stephie juggles a friendship with fellow bridge player Nasreen and her souring marriage to a bitter BNP supporter. As the bridge classes intensify, so too do the external strains. Confined to the classroom, the piece wisely settles on an intimate setting in which to slowly rachet up the pressure, but Louise Hill’s direction visibly labours to bring the urgency of the outside world into this neutral space. As escalating events occur offstage, including the brutal racist beating of a young Pakistani boy, there is an inevitable atmosphere of reportage; someone is always running through the door slightly out of breath. The evocative single syllable of Monaghan’s title suggests both a deck of playing cards and the gangs behind racist crime, but it also hints at a pack in the sense of a communal group. Appropriately, when the complexities of the play’s subject are most delicately handled, it is through the friendship that cuts across colour and creed.